What’s the surprise? Two of them: a) it has a ‘magic’ chocolate sauce that starts on top and ends up in the bottom when it’s cooked and b) it is the most delicious, unhealthy chocolate pudding recipe but with a healthy twist as it has a fruit and vegetable to give it some plus points. 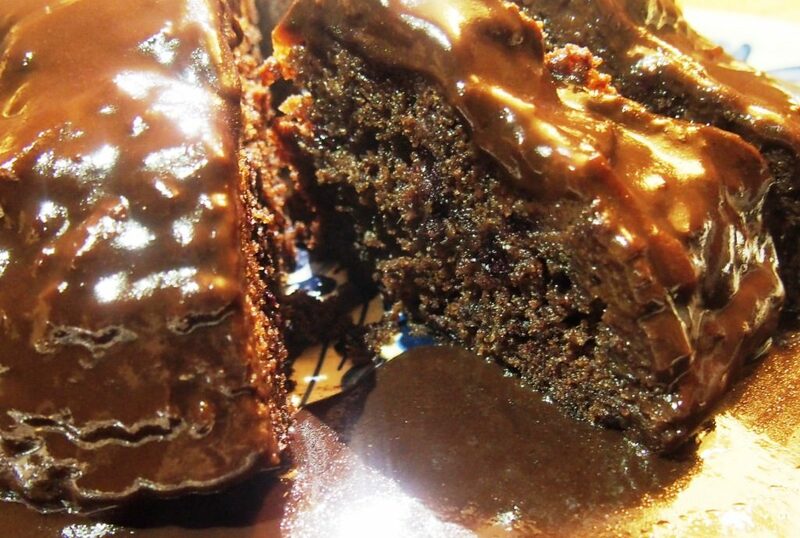 If there is any left the pudding is lovely eaten cold as chocolate cake. 1 raw courgette or raw, peeled beetroot, grated. Add the eggs, flour and cocoa and mix well, add blackcurrants and courgette or beetroot and gently fold in. Grease a deep, heatproof dish and pour in the chocolate sponge mixture. Mix together the sauce ingredients, pour the hot chocolate sauce over the sponge mixture. It will sit on top of the batter and gradually soak in, don’t stir it, just leave it! Bake for 20-30 minutes. Check after 15 minutes and if the top of the pudding is browning too quickly, cover it with some tinfoil. Take out of the oven and leave for cooling for 15 minutes, then cover the dish with a large plate, turn both together quickly so that the pudding stands on the plate. The chocolate sauce will gently flow over the pudding. Then remove the dish and serve warm with custard or vanilla ice cream.